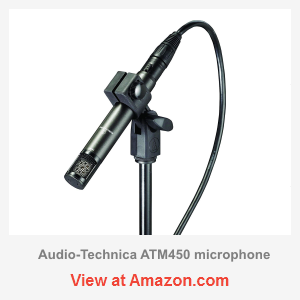 Audio-Technica ATM450 is a low profile side-address cardiod condenser, which can be used for miking a wide range of instruments and percussions. Though unsuitable for vocals… it offers a small footprint and has a situational placement advantage over more common front-address instrument mics without sacrificing a bit of quality. On contrary, this mid-range model sounds surprisingly smooth for a small diaphragm condenser: despite adding a noticeable amount of presence, it just cannot be described as harsh. This mic is not well known but it’s pretty damn good to have and it’s not too expensive. Audio-Technica ATM450 has a brightened response that emphasizes presence, slightly adding to upper midrange and brilliance. Interestingly the peak is at 6.5 kHz, which cannot but remind of SM57 albeit with less aggression and more smoothness to it, and of course a far superior clarity of a condenser. The midrange is expectedly flat and uncolored. The lows present another surprise: at first glance on frequency response, they may seem like rolling off, but that’s not true. The lows are only brought down a few dB lower (which is hardly noticeable) yet remain flat all the way to the bottom, claimed @ 40 Hz. Talking about lows, ATM450 indeed sounds very rich without noticeable distortions or color. This is why, it can well be used on bass cabs and it’s not a gimmick, because the lowest note on 4-string bass guitar is 41 Hz, so it perfectly fits the specs. To match the claimed response, the mic should be placed on-axis 12” from the source, though I suppose you should place it a few inches closer because the diaphragm is actually recessed into the cab but that’s the theory. Another application that comes to mind is miking a double bass since they have a similar response, though you’d still need to keep some distance. Audio-Technica ATM450, thanks to its side address pickup has another interesting usage, which is miking a closed lid grand piano. For this setup you would need two mics, one for higher and one for lower register. You would then mount them inside the piano, pointing to the strings. This can produce some very good results: since the lid is closed, the air pressure stays inside, which allows capturing the richness of the lower register in its entirety. On the other hand, a closed lid provides isolation and helps greatly reducing the bleed from other sound sources. One of the great usage for this mic is overheads; if you can grab a pair, they will make your life happier. If you have too many cymbals, you would also need spot mics, otherwise you will not be able to hear all the nuances, effectively making the drummer sound weird. ATM450 does work for spot miking, especially on hi-hat but it could turn out expensive if you have to buy many of them. For other cymbals, I personally prefer the SM81 but it’s actually even more expensive so this doesn’t help. However, for a light drum kit a pair of ATM450 overheads will do great, making it easier to build a stereo image as well. ATM450 sounds good on toms too, but there are many specialized mics than can get the job done much cheaper, so this would be a waste. I did leave the snare drum for the dessert… but I think this could be the best usage for the mic, especially when miking a snare top in a double mic setup. Oh boy, not only it fits the snare perfectly – the sound just blows you out of the water! Even in a single mic setup, it can make a tremendous improvement. I already compared it to SM57 and not without a reason, as it has been an industry standard for snare. ATM450 offers a similar tone only the sound is far superior. One may find it difficult to envisage how this mic works and sounds because the specs don’t show much of significance, the model itself is relatively unknown, and so it’s easy to overlook. 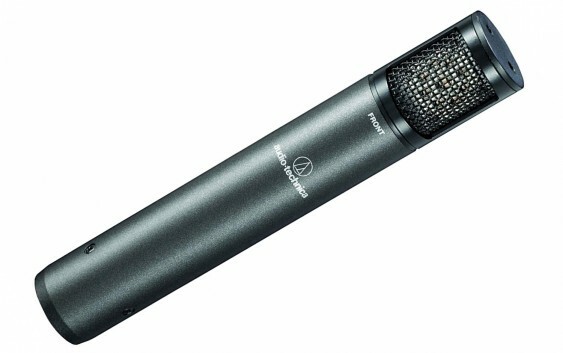 However, make no mistake; this is a solid quality mic, which if used correctly can rival more expensive units. The only caveat, it can be a hit or miss if you aren’t sure what to expect. Therefore, I would not recommend it if you are looking to buy your very first mic. But if you know what you’re doing and looking to expand your collection, then it’s definitely worth buying – it will find its use and prove to be an amazing addition.